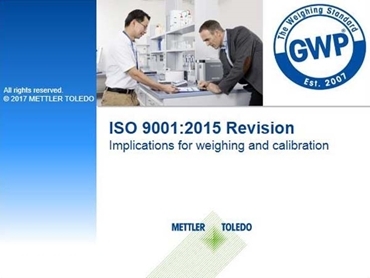 Mettler Toledo presents a new on-demand webinar on the implementation of ISO 9001:2015 so that weighing and calibration processes can be made compliant with the revised standards before the September 2018 deadline. Recommended for ISO 9001 certified organisations, which rely on processes that involve weighing, Mettler Toledo’s free on-demand webinar on Good Weighing Practice will assist with the implementation of the new risk-based process approach and help adapt their quality management systems to the latest version of the standard. The webinar describes how ISO 9001:2015 places more emphasis on the process approach, making risk-based thinking an important focus, and how continuous improvement can be achieved by implementing the Plan-Do-Check-Act (PDCA) cycle. The revised ISO 9001 standard requires an organisation to ensure that every balance or scale used in a weighing process is accurate enough to achieve the intended results. Weighing has a critical impact on product quality, because quality is directly related to the accuracy of weighing results, and that accuracy is determined through calibration. Mettler Toledo can assist any organisation with making a simple transition to the latest ISO 9001 revisions for any process involving weighing. Good Weighing Practice, which was established in 2007 based on many years of Mettler Toledo’s weighing expertise, takes the risk-based thinking approach. The elements required for each stage of the PDCA cycle are already defined and fully developed within the GWP Recommendation and GWP Verification packages, making it easy to ensure that any weighing process is ISO 9001 compliant. The free on-demand webinar clearly explains the scope of the ISO 9001:2015 changes and implications for weighing processes, while providing simple guidance and recommendations on how to implement risk-based thinking with respect to weighing.